This song pops up in my mind every time I see one of the beautiful, flowering Jacaranda trees. This time of year (May June), when these trees are nearly barren of leaves and as stark looking as decduous trees in winter up north, they suddenly burst forth with a nearly solid covering of lavender-blue flowers. For about 8 weeks the tree covers itself with showy trumpet-shaped flowers that are about 1.5 inches wide and arranged in panicles (pyramid shaped clusters) that grow at the tips of branches. The flowers drop off individually – the purple rain – carpeting the ground beneath the trees. The spectacular jacaranda tree, which is native to Mexico, Caribbean and South America, is enjoyed as an ornamental in many near-frostless areas all over the world. But unfortunately is not as plentiful here on the Costa Blanca as one could hope. 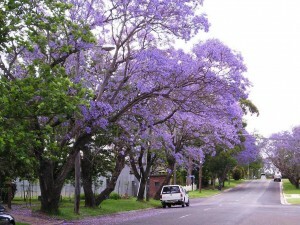 Pretoria in South Africa is called the Jacaranda City due to the enormous number of Jacaranda trees planted as street trees. In flowering time the city appears purple in colour. The time of year the Jacarandas bloom in Pretoria coincides with the year-end exams at the University of Pretoria, and students believe that if a Jacaranda flower drops on your head, you will pass all your exams. 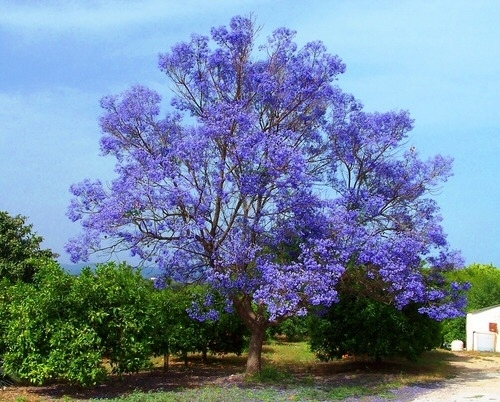 The jacaranda tree has many species, but the most common and popular is the blue jacaranda tree with the botanical name Jacaranda mimosifolia (because the foliage of this tree resembles that of the mimosa). Nurseries sometimes label this tree J. acutifolia which is a synonym. It is a large tree with fine-textured, fern-like pinnate leaves. Young trees are upright, but assume an irregular branching pattern that produces beautifully asymmetric open crowns as the trees age. 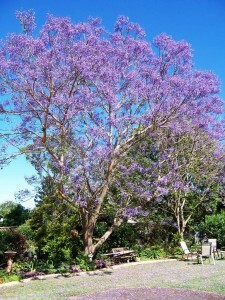 The jacaranda tree sheds its foliage at the end of the growing season making it a deciduous tree type. However, it does not necessarily shed all its leaves in winter unless the temperatures go down drastically. Young trees will die if exposed to frost, though mature trees are quite hardy. 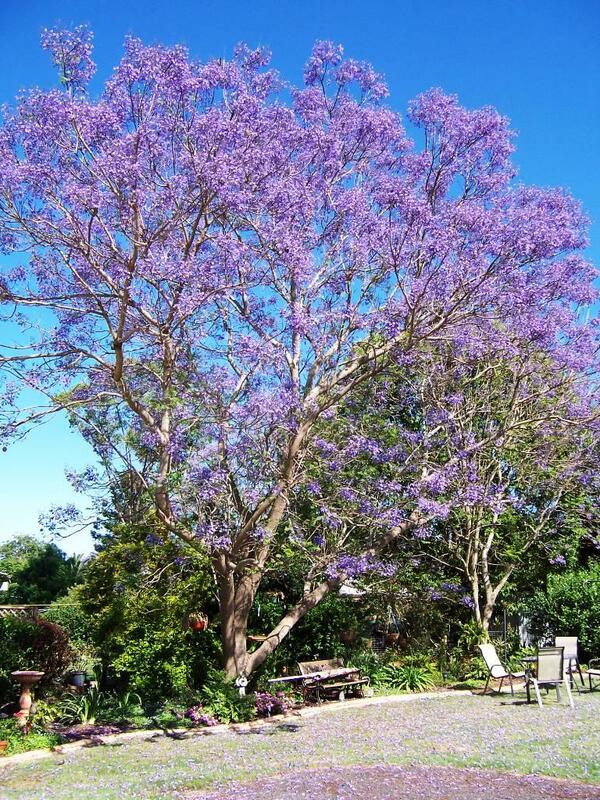 The blue jacaranda tree is one of the most popular trees that people love to grow, because the delicate fern-like leaves and the purple flowers make them look like trees straight out of a fairytale. The jacaranda tree is a fast growing, shallow rooted tree that thrives in fertile, well drained sunny locations – it needs a lot of sun. It does not like heavy, wet soils or strong winds – especially not if saltladen. In the right climate, the tree reaches 12-15 m in height (35-45ft) and about 7-10 m in width (20-30ft). Its roots are fairly aggressive, and so the tree should not be planted too close to the house. 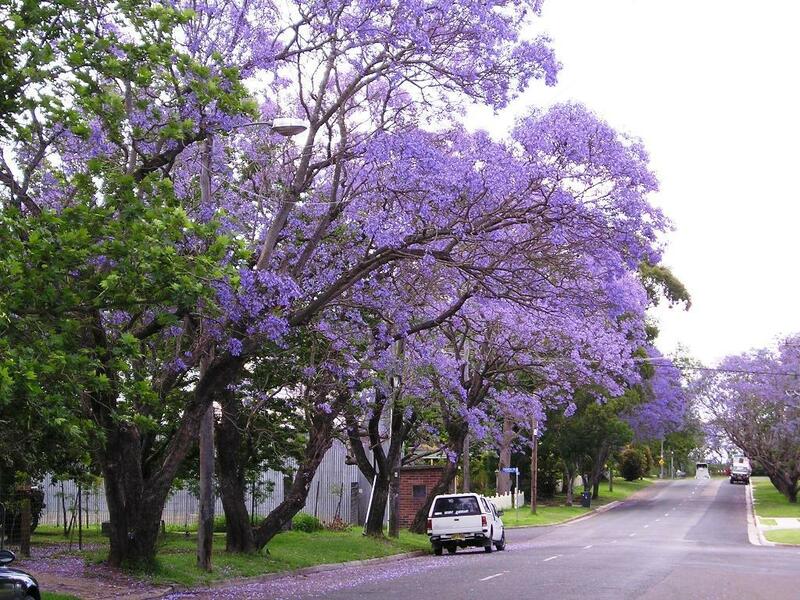 Jacaranda trees are ideal for urban street and park plantings and as ornamental trees for landscaping in large and medium sized gardens. They are sometimes planted in small backyard gardens, but should not be. People can get so carried away by its spectacular performance in flower that they forget that it is a fast growing tree that rapidly outgrows a small plot. The species, as its dimensions imply, is fine as a shade tree, but thought should also be given to its potential as a focal point in the garden. They create the perfect summer experience by erupting in a blaze of brilliant colour when most spring flowering trees have long shed theirs. Jacaranda’s seasonal flower display can be so overwhelming, that it ought to be strategically placed for maximum effect. But keep in mind that the tree tends to litter quite badly. The fallen flower petals can make a decorative covering on the ground, but they are somewhat sticky, and together with the falling seed capsules, can be a nuisance in the vicinity of parked cars or swimming pools. It is best to choose a place where its stunning purple flowers can be seen easily and where the falling flowers will not be a problem.spectacular jacaranda tree. The jacaranda tree requires some maintenance. Regular pruning is crucial, especially in the first few years after planting. The branches of the tree have a tendency to grow at narrow angles to the trunk and need removing before they become troublesome. One very important point is that branches must never be shortened as this will lead to a group of new stems to sprout out from the place where it is cut. Instead the limbs should be carefully pruned at the base of the trunk or from the branch to which they are attached. These were some of the facts of the jacaranda tree to keep in mind if you decide to plant one. It is probably the most beautiful tree you can have in your garden that puts on a breathtaking floral display, and the best part of the tree are the feathery leaves that make it an asset to the landscape of your garden throughout most of the year. Usually dispatched within 3 to 4 days. Dispatched from and sold by Seeds Shop. 1 packet of 25 seeds. Privick Mill Nursery germination instructions included. Sub-tropical species, ideal for bonsai cultivation. The Blue Jacaranda, Jacaranda mimosifolia more often known simply as the “Jacaranda”, is a sub-tropical tree native to South America that has been widely planted elsewhere because of its beautiful and long-lasting blue flowers. The Blue flowers form a dense terminal clusters of lavender-blue, lightly fragrant, trumpet-shaped flowers which are up to 5 cm long, and are grouped in 30 cm panicles. Blue jacarandas bloom in spring and early summer. Jacarandas flourish well in sandy, well-drained soils. Jacarandas should be watered during dry periods. Pruning of branches is very much recommended so that the branches of Jacaranda remain less than half the diameter of the trunk to help keep the plant intact and increase durability. Sowing: Scarification: Seeds need to be scarified to facilitate germination. Place seeds in hot water for 24-48hr, let water cool down. As an option, you can renew the hot water after 24hr. Sowing :After the stratification period, seeds can now be sow outside or in container. Sow 1/16″ deep by 70-75F degrees. 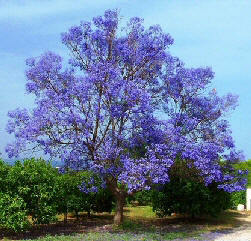 The beautiful, flowering Jacaranda trees in Spain. This is an invitation to come and have a look at another Groups Facebook page. https://www.facebook.com/groups/1623745237901625/?fref=ts It is called Hints and tips about gardening in Spain. The pitfalls and the joys. Limited advertising is allowed provided it is on subject. Spain info covers local towns with local accommodation. Spain info also covers info local days out in Spain on the Mediterranean. This site also of info has information on gardening in Spain Mediterranean style. Spain info with information on cooking Mediterranean style. Spain info also covers Bowls Clubs Golf Go Karting fishing Caves and other sports here in the Mediterranean. The web site Spain info also lists the Local Hot Water Spas many of them dating back to Roman times.